Paulo Coelho’s hands show a heavy development of mounts, short, straight, plump and flexible fingers with square tips, a very large thumb with a well developed and supple top phalange, and good knots on the back of the hands. Unfortunately, the Headline is not visible and therefore I had to rely solely on the shape of the hands and fingers to get a glimpse into his personality. It was disappointing to be unable to check the Headline on the hands of an intellectual. that Paulo Coelho is a highly imaginative, intelligent, and creative man who is quick thinking and impulsive and likes the good life. His creativity is of the practical, not intellectual or esoteric type. His hands reveal him to be a person with pragmatic views who is guided by the head and someone who is far from religious or superstitious. There is a melancholy side to the personality and some love of money is evident. However, without seeing his headline I cannot confirm this aspect. There is considerable organization of thought and thinking ability and these qualities would go to make him a good author. His strong willpower cannot be called a flaw in his personality, but at times this dogged determination can become a fault as it could turn him into someone who is stubborn and a bully. This trait, along with Coelho’s pragmatic and no-nonsense nature, could result in his rubbing people the wrong way. However, he has the best of intentions, and a genuine warmth and liking for people. He is a straightforward man with an affectionate and forgiving nature. If I had not known who this hand belonged to, I would not have been able to guess that it belonged to a famous writer or intellectual. I would have thought that it belonged to a successful man but could not have guessed the area of success. I would have ruled out business success as the requisite skills are not shown. What I would have known is that this is a creative man, quick-thinking, mentally organised, and determined. 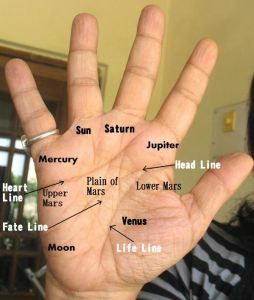 You might also like to read what the hand says about Cristina Fernández President of Argentina or check out the hand readings of Spiritual Leaders from around the world. He is a good story-teller, but I am not buying his intellectual arguments. I read one book of his and I was not very impressed with his philosophy. Can you post Palmsitry of Srila Prabhupada, the famous Acharya who spread Vaishnavism all over the world? If I get the proper photos then certainly I can. I will check if they are available.